A few years ago I was helping my neighbour with cleaning up her basement and we found an old cast iron roasting tray there. It looked like grey and oxidized. My neighbour told me she got that roasting pan years years ago from a friend's mother and it must be something from the beginning of the 20th century. It is really an old cast iron without enamel. My neighbour wanted to throw it away and I asked if I could have it, because it looked nice and I thought it would be a great flower pot for my basil or other herbs. I got it, put it to my basement and for the next years I forgot about it. 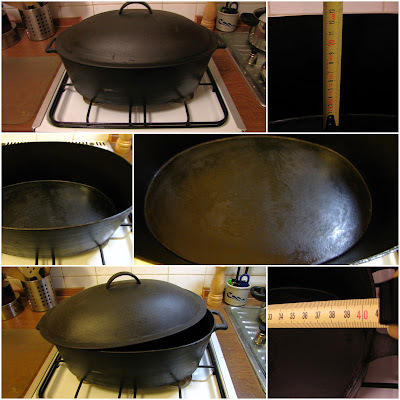 In the Summer of 2008 I wanted to throw it away but then I luckily read an article (which I can not find anymore) how to rescue old and oxidized cast iron. I had to "burn it out/in" how we say in German. First of all I did what the instruction said: I washed it with water (and remember one thing never ever use dish liquid for washing cast iron or put it to the dish washer - one except: if it's 100% covered with enamel it would be dish washer safe) and scrubbed with an iron steel brush. As soon I was ready I dried it with a towel before it could start oxidizing again. Than I oiled it with olive oil and put on both of the gas burner of my stove. I continued this action also after it started smoking. I was burning that cast iron roasting tray from every side always on the highest power of the burner. I don't know how long it took me, maybe an hour. Because I was afraid one of the neighbours could call the fire brigade seeing so much smoke I was doing it in the middle of the night when everyone was sleeping. I did the same thing with the lid. After burning my pan out it got a wonderful patina which you can see on the pictures. It reflects the light of the camera. This patina makes the roasting tray like a non stick pan, it's nearly like glass. After using a cast iron pan just wash it with water, dry it as soon as you can and oil it a little bit. As far as I know there aren't a lot of producers of cast iron ware left in Europe. That's also why the stuff is so expensive (starting at 80 Euro up) but as you can see you really buy it for centuries and quality always had it price. High-quality and best producers are Le Creuset from Picardy/France (mostly with enamel) and the other is Skeppshult from Sweden (without enamel). Cast Iron is starting to be more and more popular since people started cooking on induction ovens (a great hit in Germany), but it works as well wonderful on a gas stove. I've never tried cooking with cast iron on a typical electric stove. Here are the pictures of my 2 gallons big (40 cm wide and 14 cm deep) cast iron roasting tray after the "operation RESCUE". The reflects are the great patina it got. If you have an iron steel pan, READ THIS LINK. Okay, it's in German but you can see on the pictures what they're doing. They use potatoes and salt for burning out an iron steel pan. I wouldn't do it with my cast iron but with a steel iron for sure.